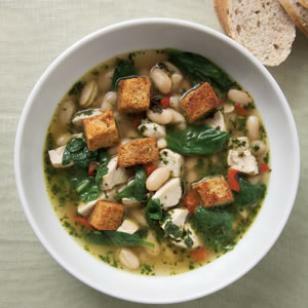 This fragrant, Italian-flavored soup takes advantage of quick-cooking ingredients—boneless, skinless chicken breast, bagged baby spinach and canned beans. It features a simple homemade basil pesto swirled in at the end to add a fresh herb flavor. If you are very pressed for time, you can substitute 3 to 4 tablespoons of a store-bought basil pesto. the chicken begins to brown, 3 to 4 minutes. Add garlic and cook, stirring, for 1 minute more. Stir in broth and marjoram; bring to a boil over high heat. Reduce the heat and simmer, stirring occasionally, until the chicken is cooked through, about 5 minutes. Nutrition Bonus: Vitamin A (110% daily value), Folate & Vitamin C (20% dv). Share your opinion of of this recipe after you have tried it! I have also cooked this soup for my family and friends and it is everyone's favourite. Everybody loves this soup! It's low in calories and good. I use fresh rosemary, thyme and basil in the soup in addition to the pesto. It smells wonderful and even children like it.